Since inception, Facebook users have uploaded over 70 million 360 photos. And of these 70 million 360 photos, exactly zero were taken using Facebook’s built-in camera. Starting today, that all changes. 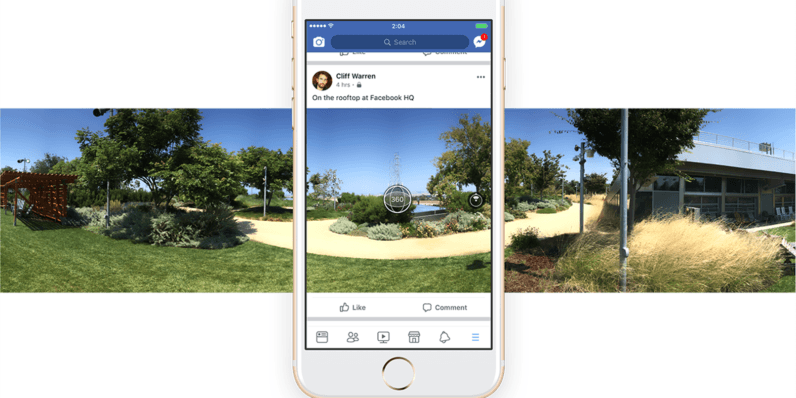 Users can now take 360 videos from the Facebook app itself, and upload them instantly for viewing on their Timeline, in albums, or Groups. Previously, a 360 photo required users leave Facebook’s mobile app, open a camera app on their phone, shoot the image in panorama mode, and then re-open Facebook to upload the image. It’s not exactly a prison labor camp, but for a company that strives to keep users on the platform, forcing them to leave in order to use a feature didn’t make a ton of sense. And if you didn’t feel the Facebook god’s were shining down upon you already, we’ll see a handful of highly-anticipated new features. My favorite is the ability to add a 360 photo as your Cover Photo, but you could just as easily get all warm inside about tagging friends, or zoom. Open the Facebook app and click ‘360 Photo’ from the top of your News Feed (near the update status icon). Press the blue button and take your panoramic image. Select your preferred starting point for the photo, and share.